It's time to remember the roughly 200 brave individuals (many of them still nameless) who chose to plunge to their deaths on 9/11 rather than face immolation or massive smoke inhalation (or the imminent collapse of the towers themselves). According to a story in the Daily Mail, "sometimes the fallers were separated by an interval of just a second. At one point nine people fell in six seconds from five adjacent windows; at another, 13 people fell in two minutes." 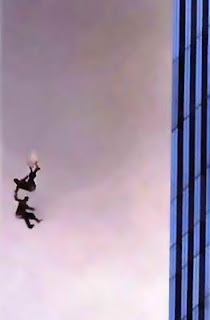 Twenty minutes after the first building was struck, two people fell simultaneously from the same window on the 95th floor. Some individuals (above) chose to hold hands with a partner on the way down. Most jumpers were in free-fall for about 10 seconds before hitting the ground at between 120 and 200 miles per hour.